To make free phone calls online you need to check if your hardware is ready. First – what is Java? Java is a computer platform and program language. There are lots of applications and websites using this fast, secure and reliable environment. Many websites have Java components that you can use only with a browser that supports a Java plug-in. 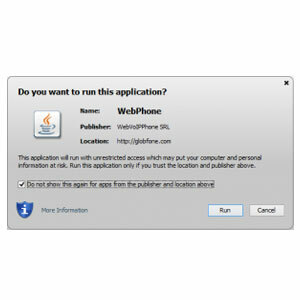 Globfone WebPhone (VoIP internet phone) is based on the cross-platform Java Standard Edition (SE), which is supported by lots of devices, all major OS (Windows, Linux, MAC, etc) and all major browsers (IE, Firefox, Chrome, Opera, Safari, etc). Unfortunately some mobile web browser does not support Java SE but there is nothing to be worried – for these users we’re going to release dedicated mobile app. If you are not sure if you already have Java preinstaled on your computer please check this link and follow the instructions on Java official web page. While using Globfone CALL button by default your browser should ask you for permissionyou to run Java applet. Make sure you using Java ver.sion 10.7 (Lion) or above. The Java plug-in for web browsers relies on the cross platform plugin architecture NPAPI, which has long been, and currently is, supported by all major web browsers. However Chrome publisher announced to remove NPAPI support from this browser by “the end of 2014″, thus effectively dropping support for Silverlight, Java, Facebook Video and other similar NPAPI based plugins. Recently, Google has revised their plans and now state that they plan to completely remove NPAPI by late 2015. As it is unclear if these dates will be further extended or not, we strongly recommend Java users consider alternatives. Instead, we recommend Firefox for our Calling services.